Happy Sunday everyone!! How was your week? I've had a pretty great week filled with lots of smiles and even a few new adventures that I am excited to share. Before I get started though I just wanted to say that I did have some very frustrating and negative things happen in my life as well over the past week. I have moved on from them though and that is what is key to a healthy and happy life. Everyone has bad days and the best thing that you can do is deal with them, accept them, and move on. Those experiences are in the past and that's where they'll stay, no need to dwell on them! I have pet chickens and they're the greatest thing. I love chickens so much. They just hang out in the yard (and the neighbors yards) all day long eating and walking around. What a life!! Jack, the rooster, is such a crazy little guy. He chases people sometimes and crows constantly but is so sweet whenever you hold him. 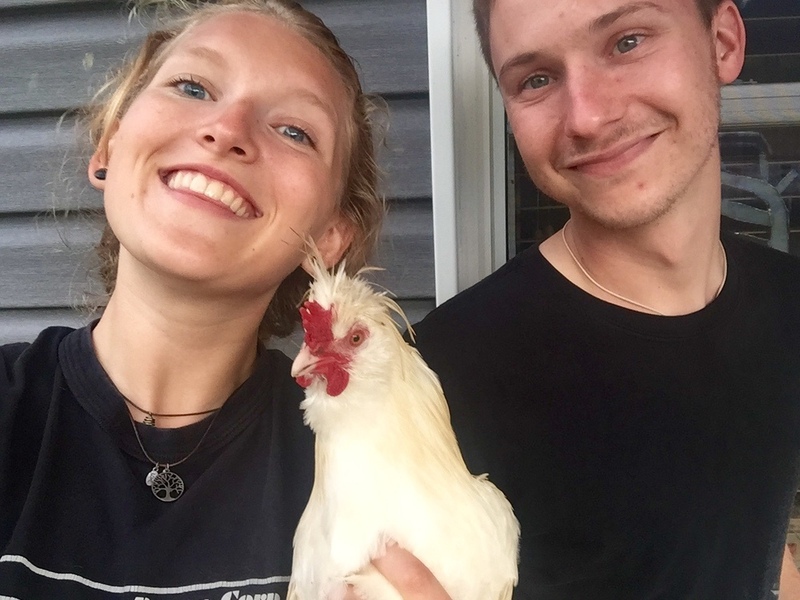 I was carrying him around for a while the other night and there's no way that spending some good quality time with your chicken wouldn't make you happy! Ahh, Chipotle. I am obsessed. I would eat it everyday if the nearest one wasn't 45 minutes away. Every time we're in the area Darrin and I go. He's not a big fan of it (what a weirdo) but he goes anyways because he knows that it'll keep me happy. We went this past week and I got my usual; white rice, black beans, sofritas, fajitas, mild salsa, lettuce, and I tried for guacamole but they we're out. What!? But it was still good regardless. Darrin got a sofritas burrito and I ate a quarter of his too. Mmmm. It's so easy to eat vegan there and I love that so much because it is not easy to do in my town at all. I'm dreaming about it right now. I think I'll have to venture back sometime this week. Blueberry picking!! I went blueberry picking this past week with my mom. You can read about it right here! I got a pretty good picture of me and Pebbles this week and I'm so excited. She knows whenever you're taking her picture and she doesn't cooperate but I always keep trying. She's 14 and still loves to walk and beg at the dinner table. But I'm one to take lots of photos, so when I captured this I was I felt quite accomplished! Also, this is a good motivator to always keep trying! Photos like this of Pebb and I are few and far between because she's difficult to capture but it happened and I'm excited. 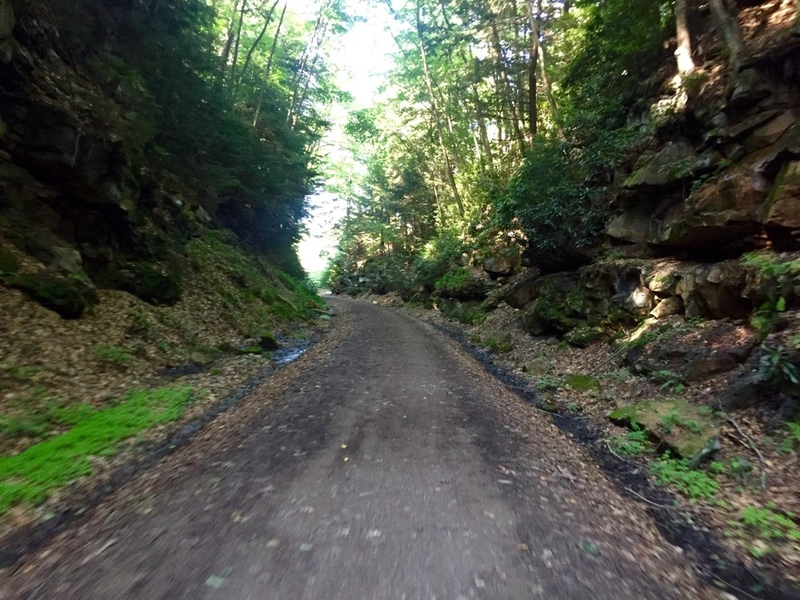 I went to bike on a new trail this week! I've been to the trail before but only to walk twice. I was having a difficult time this day so I just went to bike. I biked 20 miles. I ended up seeing a bear cub, a turtle, some deer, and a bald eagle! It was a great ride and I really enjoyed biking somewhere new! I want to try out some other trails now too. New adventures are great! Smoothies as big as my head!! I had this today after a running, biking, yoga-ing morning and it was so refreshing. I love having smoothies in the summers because I can make them as cold as I want and I don't freeze after drinking them. It was so warm today and this drink was perfectly refreshing. So awesome! That's it for me this week and now it's your turn! Share with me your positive events from this past week. Big or small, I’m interested in hearing them! Comment below, email me, or share with me on Instagram! Let’s share positivity with one another and create a positive world!